To make the most of your home and backyard you want to extend your living space and create an outdoor oasis where you can cook, entertain, and relax. There are several options to choose from when it comes to designing your outdoor space including patios and decks. In the sections below, we explain each of these and describe the differences between them. The biggest difference between a patio and a deck is where and how each is constructed. A patio is built directly on the ground whereas a deck is a raised structure that has a support system. A patio is likely to be located directly in the backyard and can be built right up against your home. Typically, a deck is physically attached to the structure of your home with a door or other entrance to make it easy to move between from the deck to inside your home. A patio is often used for sun tanning, relaxation, and other activities. They may be found beside a pool or located in a garden setting. Patios can be fully enclosed with glass or vinyl 1 walls and a roof to provide protection from the elements, allowing year-round enjoyment. Decks are normally used for grilling and outdoor entertaining, however their use is not limited to these activities. 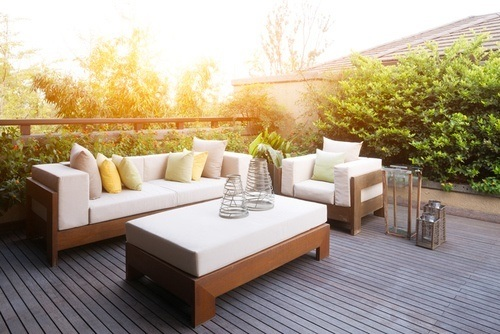 Often homeowners will furnish decks with dining or conversation furniture and other features to enhance their outdoor living space. 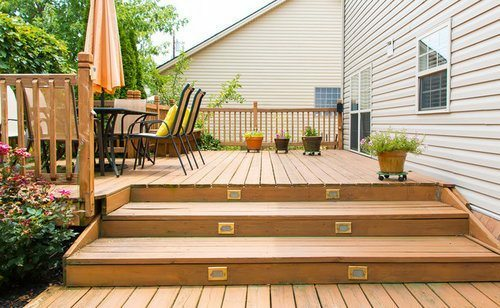 Installation of a deck is more difficult than a patio and is best done by professionals. Supporting structures for the deck need to be cemented into deep holes drilled into the ground, and additional considerations need to be made for properly attaching the deck to your home. A deck can be built on land that isn’t level, making this an excellent choice for uneven yards or sloping landscapes. In some cases, waterproofing materials may be necessary to ensure the foundation of your home isn’t compromised. Patios are easier to install but require extensive preparation of the ground surface where they’ll be laid. They are best installed in areas that are relatively flat and even as the patio is installed directly on the ground. 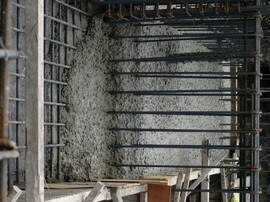 Often this area will need reinforcement with rebar 2 if using poured concrete, and the ground underneath must be compacted. 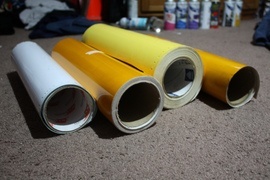 This can be done as a DIY project, but it will be a lot of difficult work. The posts and support structure of a deck is often constructed of pressure-treated lumber. Typically the flooring is made of wood, but there are alternatives including composite materials that require less maintenance. The wood used for the deck flooring is often pressure-treated pine or cedar. A potential hazard is that wood can become slippery when wet, and ice can easily form in winter. Patios are generally constructed of concrete, stone, pavers, or other hard materials. Direct sunlight, especially if your patio is made of dark-colored materials, may cause the surface to become very hot. Patio surfaces that are smooth can be problematic when wet, creating a slipping hazard, and careful consideration should be given to the intended use of the patio when deciding on a material. For example, a concrete patio beside a pool is less likely to cause slips and falls than a patio made of smooth stone like granite. Pressure-treated pine is the most common decking material and costs between $7.50 to $9 per square foot, whereas hardwoods and modified woods cost between $18 to $35 per square foot. Another important consideration is that labor costs may also vary depending on the material used. Composites cost more to install than hardwoods, with most labor running between $13 and $36 per foot, making the total per square foot cost of building a deck between $21 and $71 per foot, with an average cost of around $33. A 16 x 20-foot deck would cost between $6,720 and $22,720, with an average cost of $10,560. Patios require significantly less material and labor and can be relatively inexpensive, depending on the size. The average cost for a 16 x 12-foot concrete patio using heavy concrete pavers will be around $700 for a DIY project. Typically, professional installation of the same-sized patio made of poured concrete will cost between $2,000 and $4,000 for materials and labor. A wood deck requires annual power washing to protect against mold and mildew. Typically, a deck should be stained and sealed at least every two years to improve durability and increase lifespan. Patios can easily be cleaned with a hose and require little ongoing maintenance. Regular inspections for cracks are necessary to prevent water leakage under the patio which may result in erosion. In extreme cases, the patio may crack, and the entire surface would need to be removed and replaced. Both decks and patios are subject to the weather, and depending on your climate and the materials used, durability can be affected. A wood deck is subject to warping, cracking, and the effects of moisture regardless of how well you maintain it. Stain and sealant applied to the flooring and support structure can slow these processes, but they will occur naturally over time and affect the lifespan of your deck. A standard deck lasts between 10 and 15 years. Stone or concrete patios can have near unlimited durability if maintained properly. If you live in a climate with extreme temperature changes, your patio may be more susceptible to heaving, which is the upward ground movement caused by expansion of the soil, and cracking. This will impact the longevity, but at a minimum, you can expect a properly installed patio to last at least 25 years. Due to their outdoor location, mosquitoes, wasps, and flies are a problem when enjoying your deck or patio. Both decks and patios can accommodate mesh enclosures, screens, and other forms of free-standing netting to provide some protection from flying insects. Wood decks may also be jeopardized by termites and other wood-boring insects. As part of your regular maintenance, check for these bugs and treat any infestations as soon as possible. When building a deck, you may be required to obtain a building permit from your local municipality because a deck is attached to your home and physically alters the exterior appearance. Typically, a patio doesn’t require a permit but check with local authorities before building either a deck or patio to make sure you understand all local permitting requirements. How much does it cost to install a patio or a deck in my city? Cost to install a patio or a deck varies greatly by region (and even by zip code). To get free estimates from local contractors, please indicate yours.